The Mary Rose was a famous Tudor warship built in Portsmouth for Henry VIII’s navy between 1509 and 1511. 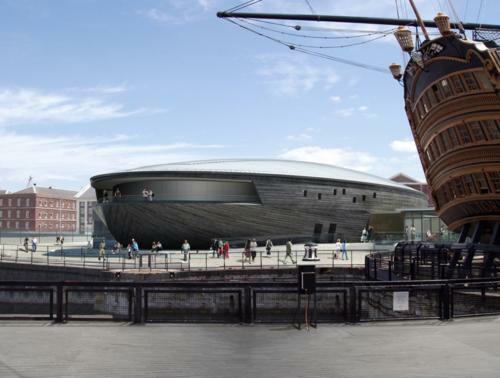 Henry VIII ordered the building of the Mary Rose, thought to be named after his sister Mary and the Tudor Rose, and the Peter Pomegranate to reinforce his navy and to protect England from the threats of the French Navy and Scottish fleets. Both the Mary Rose and the Peter Pomegranate were very different to ships built during Henry VII’s reign because they were carvel, rather than clinker, built and were equipped with heavy guns which were mounted near the waterline. The Mary Rose was equipped with 78 guns originally and upgraded to 91 in 1536 and her carvel hull allowed watertight gun-ports to be constructed. Her ability to fire broadside made her both the pride of the English Navy and Henry VIII’s favourite ship. Unfortunately, after over 30 years of service in the navy, the Mary Rose sank accidentally in the Solent on 19th July 1545 during an engagement with the French fleet. Although she sank in 1545, the good news is that she was raised in 1982 and divers were able to recover around 19,000 remarkably preserved Tudor artefacts which can teach so much about Tudor life and times. Being the flagship of the English Navy against France in 1512 – Under the admiralty of Sir Edward Howard, she was used against the French just off Brittany. 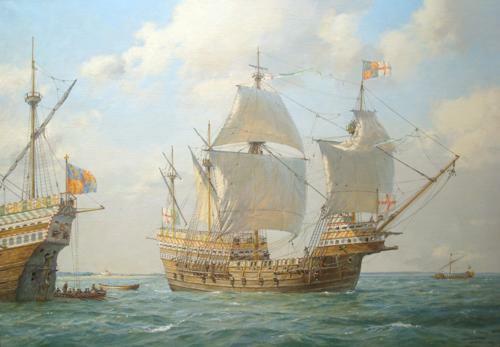 Under the admiralty of Sir Thomas Howard, the Mary Rose was used in 1513 to transport Howard and his troops to Newcastle to help in the war against Scotland. War with France 1522-1525 – According to her Vice Admiral Fitzwilliam, she outsailed all of the ships in her fleet. 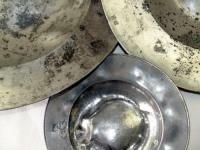 A major refit in 1528 – Click here to see a list of materials used to repair and refit the Mary Rose. 1536-1538 – Rebuilding and re-arming. 1544-1545 – English fleet escorting reinforcements to Boulogne and then moving into the Solent to intercept any French ships. She was sunk by a French hit – According to the French fleet, they hit her and she sank after they lured the English ships within range of their main fleet. Although Burchet and Sir Walter Raleigh both attributed the loss of the Mary Rose to her gunports being too close to the water line, the height of 16 inches that Burchet gives is definitely wrong as she would never have been able to even leave port if this was the case because her scuppers would have been submerged. The archaeological evidence points to the the gunports having four feet of clearance. Attempts to raise the Mary Rose in the summer of 1545 were unsuccessful and she lay in her watery grave until she was rediscovered nearly 300 years later on 16th June 1836 when a fisherman snagged his gear on the wreck. A diver, John Deane, was diving on a nearby wreck and agreed to help the fisherman disentangle his gear in return for a half share of whatever the gear was caught up on. Dean found the Mary Rose and between 1836 and 1840 was able to recover a number of items including iron guns, bows and timbers. In 1965, Alexander McKee decided to try and find the wreck of the Mary Rose and with the collaboration of Professor Harold E Edgerton and John Mills, and their sonar systems, a sub-seabed anomaly was found in 1967 which was confirmed in 1968 by a sonar survey. Between 1968 and 1971, dives were carried out on the area and timbers and even an iron gun were recovered. 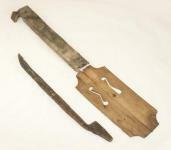 On 5th May 1971, Percy Ackland discovere three of the port frames of the Mary Rose. 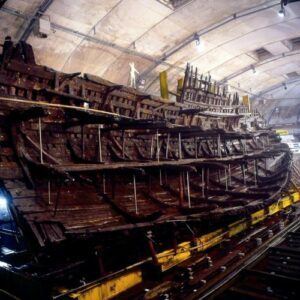 The Mary Rose had been found. The Mary Rose Trust was formed in 1979 and an archaeological team led by Dr Margaret Rule CBE began to excavate the Mary Rose wreck. This culminated in the raising of the Mary Rose on 11th October 1982 by a team of Royal Engineers. The wreck was placed in a dry dock with a relative humidity of 95% and a temperature of 2-6ºC. 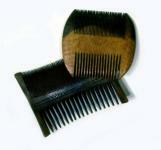 A preservation programme then began in earnest. Skeletons – The remains of around half the crew. Here at The Anne Boley Files, we have pledged to raise £500 to help build a new purpose built museum to house the ship and its artefacts. See our Mary Rose 500 Appeal Page for further details. Plus, every person who buys a plank will be entered into a raffle to win a signed copy of the Limited Edition copy of the new painting of the Mary Rose which you can see at the top of this page. 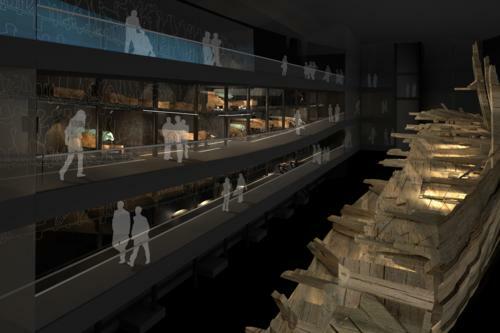 See the special “Make Your Mark” page at the Mary Rose 500 Appeal site for further details. Has any one ever done a facial reconstruction on Anne ? No, they haven’t done a facial construction on Anne because her body was buried in a mass grave along with other people who had been executed and although in Victorian times they believed that they had identified her and re-interred her under the altar in St Peter ad Vincula Chapel at the Tower of London, Alison Weir argues that this body could actually have been that of Catherine Howard. There is, therefore, no skull, for them to base a reconstruction on unless they dig up the floor of St Peter’s and try to figure out which head is Anne’s. Thanks for the comment, Katie, I hope you have been enjoying browsing the site. Not to be disrespectful like so many of you would see it as you don’t have a humorous bone in your body … But I guess you could say digging up the floor is one of those “shovel ready” projects? I’d say dig! You’ll never know what is there and what you’ll find. 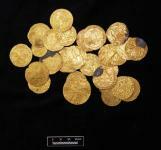 If it’s left untouched, you have a pretty floor hiding a wealth of treasure perhaps. The floor can be lifted carefully and replaced and there would be no change in the appearance. Also, for me your site is just a place for travel in time. I love ships of all kinds. The Mary Rose is something I want to follow. Years ago, I was “crew” on the H.M.S. Bounty. No not the real one, but the replica that was build in the 1960’s for the 1962, motion picture Mutiny On The Bounty. For the longest time, it was docked in St. Petersburg, Florida and that is where I worked on the ship. On October 29th, 2012, Bounty was lost in the hurricane, “Sandy,” that went up the east coast of the U.S. The lost was blamed on her captain for sailing into the hurricane. After all, the Bounty was a movie prop, not a ship built for the high seas and the rough waters. She is in about 17,000 feet of water in the abyss. The identifications were based on where they were found (they had records from the Tower which gave details on the burials), the age of the skeleton and the features. me from tɦat service? Appreciate it! You should be able to cancel notifications from a link at the bottom of the emails you receive. Hope that helps! I am curious why people are so quick to belittle Mary Boleyn. Why would some people be so sure this Mary Rose ship would be named for Mary Tudor when Henry 8th had a falling out with her after she married Charles Brandon and this enraged Henry 8th Her brother practically turned his back on her. It’s certainly possible this ship could be named after the Virgin Mary; but why are most people critical of the affairs Henry had with Mary Boleyn? According to one source, he did had a ship named for her; and no other mistress that Henry 8th took had such an honor. I think its a shame some people are so dismissive of her. There was a ship in the ENglish Fleet named the Mary of Boloyn but it was referring to the port of Boulogne, not the name Boleyn. It’s listed in a list of captured French ships, as historian Lauren Mackay has pointed out, along with the Michael of Dieppe, Griffin of Dieppe, Mary of Hornflete (Hornfleur) and others. There’s nothing to link it with Mary Boleyn.